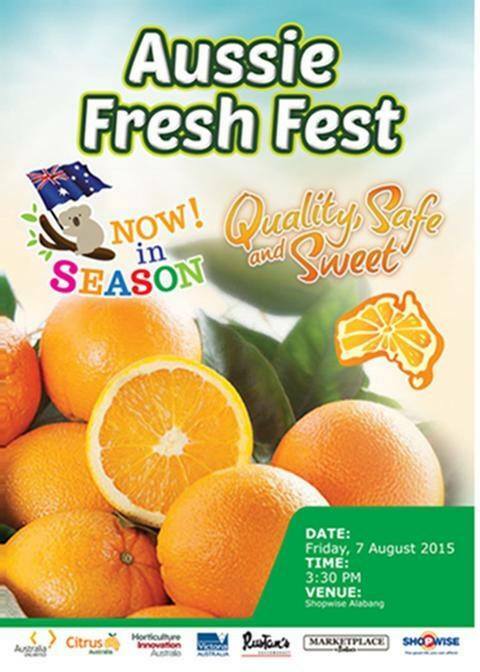 Get affordable Australian Oranges as the country’s leading sources of quality food products participate in the Aussie Fresh Fest which brings Australia’s quality oranges to fruit-loving Filipino customers and families. Anthony Weymouth (Austrade Senior Trade Commissioner, Australian Embassy), Australian Trade Commissioner Natasha Monks and Edgar Fernandez (Assistant Vice President of Fresh Mass Market, Shopwise and Wellcome)officially opened the Aussie Fresh Fest at Shopwise Festival Mall today. Filipinos can now get fair share of Australia’s quality, safe, and sweet oranges at Shopwise. Australia’s pristine growing environment and stringent food safety standards ensure that Australian oranges are of superior quality. Favorable weather has resulted in a superb crop of Australia’s famous oranges and Rustan’s Supermarket, Marketplace by Rustan’s, and Shopwise are keen on getting on the healthy trend by carrying the choice produce in all of their stores. Australia’s world-class food safety standards also ensure that each piece of citrus is a delightful treat for the whole family to enjoy. Apart from being enjoyed straight from the shelves as a healthy snack, oranges can also be used in a number of delicious ways such as in smoothies and salads, or as an ingredient in a range of savory recipes. The month-long Aussie Fresh Fest also includes other Aussie-stamped beef and lamb products and will run in all Rustan’s Supermarket, Marketplace by Rustan’s, and Shopwise branches until August 31. Rustan’s Supermarket, Marketplace by Rustan’s, and Shopwise are all managed by Rustan Supercenters, Inc., a member of the Dairy Farm International Group.